October 26, 2018 (9:00 AM – 5:00 PM), Musée Gadagne (Petit Théâtre), Lyon 5°. 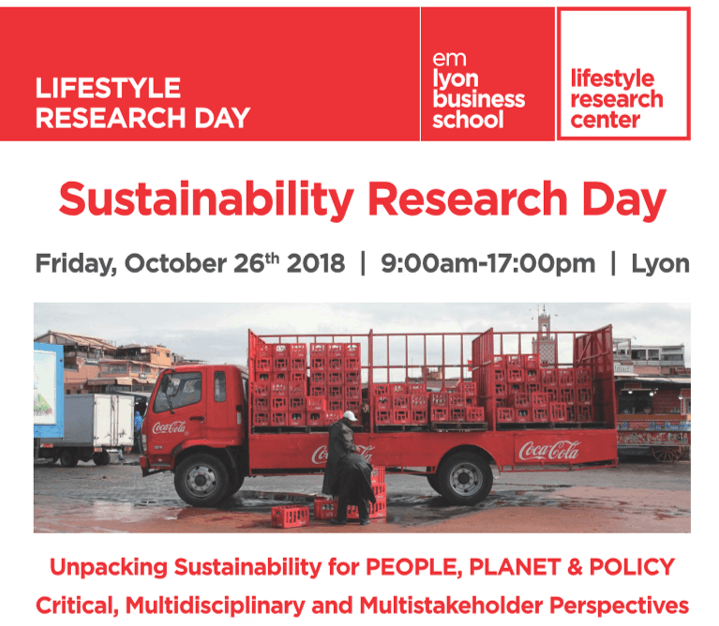 The objective of this research day is to bring together scholars from different disciplines and engage in a critical discussion about sustainability bringing together different stakeholder perspectives from consumers and organizations to policy makers. With the presentations from critical scholars, and questions from our audience, we aim to start an exciting discussion through challenging our own assumptions and research questions concerning sustainability, and raising new and critical questions for future research on sustainability. On this day, we welcome critical scholars from the UK, such as Pierre Mcdonagh, Andreas Chatzidakis, Ian Cook, and Deirdre Shaw, who will share with us organization and consumer perspectives on sustainability and ethical consumption. Scholars from different disciplines, such as Laure Saulais, Sophie Dubuisson Quellier, Benjamin Huybrechts, and Vivien Blanchet will bring to the spotlight the issues of fair trade, organization and policy maker connection, sustainable food issues, and questions to be raised by policy makers and businesses based on the local/global meanings and practices of sustainability. Other scholars such as Klara Scheurenbrand and Dominique Kreziak, will bring forth the questions of sustainability and mobility, and the residual value of replaced products in the marketplace.